"Iron? Gold? DIAMODS? Just try it!" 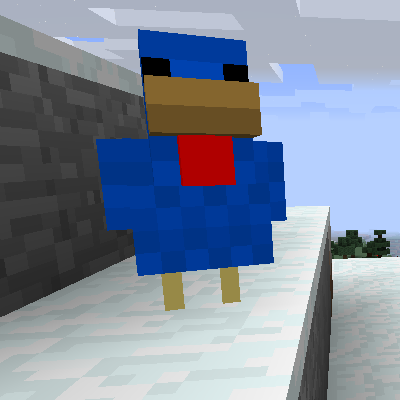 But seriously, this mod could be useful for skyblock. Going in my modpack. I see you're working on an overhaul of spawning mechanics. Does that mean the mod will be more compatible with modded biomes like in Biomes O Plenty? should be compatible with a lot of modded biome's at least thats the idea. Okay! I must be unlucky then, haha. Thanks for your response! well the over haul hasn't made it into to a release.. but Biomes O Plenty should already be compatible. Correct me if I'm doing something wrong, but I'm trying to get the chickens to drop items from other mods by editing the chickens.json file and it works...but only with vanilla items. I'd like to use items from other mods (specifically mystical agriculture) like I can with morechickens, and was wondering if this would be implemented in the future or if again, it's already implemented and I'm just doing something wrong. Is there a way to get the bone white chicken to lay a bone instead of bone meal? Are there any breeding combinations with Soul Sand chickens? If you have installed More Chickens and Ender IO you can breed it with a Gold Cicken to get a Soularium Chicken. How can we make the chickenosto please ? Can't feed baby chickens seeds to accelerate growth, is there an option in the mod (or vanilla) that effects it in latest file? We dont stop chickens from growing with seeds. If its a mod pack contact the modpack developer, as it may be something they added in. Can you add support for Open Terrain Generator? If support is already there I can't find any chickens other than the normal chicken in custom biomes so if I have to do something else I would like a response. I'll look into it but the spawning is about to get a whole rework soon. so the rework may fix this. About 1.5 years ago (Nov 2017) I was playing a pack with this mod and while the eggs were in a storage system (AE2/refined storage) they showed their stats. Last summer (July 2018) I was playing a different pack and while the eggs were in a storage system they did not show their stats. I was just wondering if anyone knew how to enable this feature.